Recently acquired by the National Army Museum (fittingly given this is the 200th anniversary of the Battle of Waterloo), this cloak was worn by the Duke of Wellington during the Waterloo Campaign. 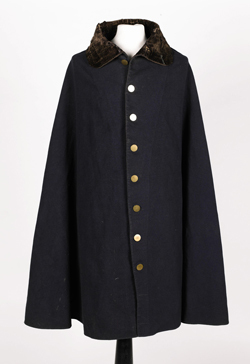 Spattered with mud, the cloak is made from blue wool and trimmed with a navy collar and facings. Purchased by the museum at auction for £38,000, it will now form part of a collection of other Waterloo and Napoleonic items in the museum’s permanent collection. The cloak can apparently be traced back to Lady Caroline Lamb, who had an affair with Wellington in the summer of 1815 and is believed to have been given the cloak as a memento. The first documented owner was Grosvenor Charles Bedford who was given the cloak in 1823 by the surgeon and anatomist Anthony Carlisle. On presenting Bedford with the cloak, Carlisle had commented that it had been given to him by Lady Caroline who had received it from the duke. The cloak has been passed down within Bedford’s family ever since. The National Army Museum in Chelsea already possesses a portrait of Wellington by Edward Stroehling (1768-1826) which depicts him wearing a similar cloak. The cloak will go on display when the museum reopens next year. For more on the museum in the meantime, see www.nam.ac.uk. PICTURE: Courtesy National Army Museum.